Most of us know that the main benefit of investing in a climate-controlled wine cellar is the proper preservation of wine’s desirable characteristics. Other than that, many wine lovers choose to store their collection in a wine room designed with form and function. At Harvest Custom Wine Cellars and Saunas, we recommend adding wine cellar accessories and art pieces to your wine storage facility. Eye-catching wine racks add elegance and value to any property. In addition to a stylish racking system, you can spruce up your wine cellar with wine room accessories. Doing so will make your wine cellar a cozy place for entertainment. At Harvest Custom Wine Cellars, we always want our client’s wine room to exude elegance and uniqueness. We recommend modish wine room accessories like wine bottle opener, decanter, and wine glasses. We also incorporate wine cellar art like murals, wine barrel carving, and wine barrel flooring into your wine cellar design. After making a careful assessment of your requirements, we will determine the most suitable accessories and art pieces for your wine room. Most wines are sealed with a screw cap. However, cork, which is a traditional way of sealing wine bottles, is still being used nowadays. Removing the cork can be romantic. However, dislodging the cork from the bottle’s opening can be challenging sometimes. We recommend that you invest in a good bottle opener. Among the choices above, the electric bottle opener is the most handy and convenient. All you have to do is press a button and pull to open a bottle. Decanting is pouring wine from one vessel (the bottle) into another container (the decanter) before it is consumed. In this process, the sediments are separated from the liquid, enhancing the wine’s flavor and softening its texture. Decanting must be done slowly to ensure that the sediments will remain in the bottle. The decanter holds the wine for some time, allowing the liquid to come in contact with oxygen (aeration). Aerating the wine opens up its flavors and aromas. The wine is then poured from the decanter into the glass after 15 t 20 minutes. The types of wine that benefit most from decanting are full-bodied wines and those with high tannin content (e.g., Cabernet Sauvignon, Syrah, Cabernet Blends, Syrah Blends). A decanter should be made from clear glass, and usually has a wide base and a narrow neck. Another important wine cellar accessory is the wine glass. Wine glasses come in various styles. They make wine look tempting. Take note that the shape and size of the glass’ mouth affect the wine’s taste. Wine glasses with a wide base, for example, provide more room for air circulation than those with a narrow base. Additionally, a large bowl allows you to swirl better and let the wine release its aromas. The stem is also an important factor to consider when buying wine glasses. There are wine glasses with stem or without stem (stem less). At Harvest Custom Wine Cellars and Saunas, we recommend stemmed wine glasses because holding the bowl will transfer heat from your hands and affect the wine’s taste. Add character to your cellar by adding murals. They can be an eye-catching backdrop for your wine room. There are endless options for mural designs including your favorite countryside, wine themes, landscapes, and vineyard sceneries. You can send a photo as the basis of the mural that you want to incorporate into your wine cellar. You may also request to customize your mural design according to your personal preference. Another option is to hire an artist to come over to your place and hand-paint the mural onto the wall or ceiling. 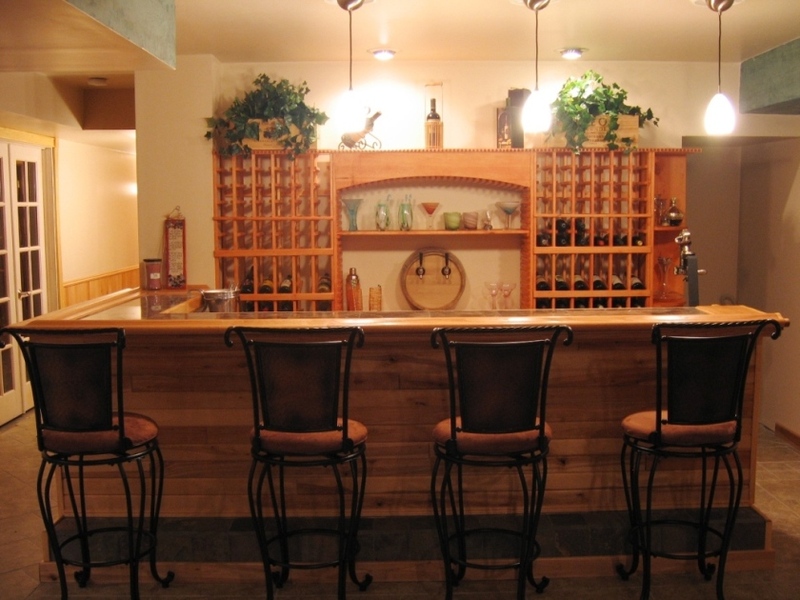 An eco-friendly way to accessorize your wine room is by using wine barrel carvings. Wine barrels, which have been used for aging and transporting wines for many years, serve their purpose for about three years. Used wine barrels are usually thrown into the landfills, used as planters, or sold as firewood. Master wine cellar builders in Virginia recommend these reclaimed wooden containers to be used as wine room accessories. Wine barrel art carvings are famous, not only because they help save the environment, but also because they add character to a wine cellar. You have the option to choose a design to be carved on the barrel ends, which include staves and hoops surrounding them. 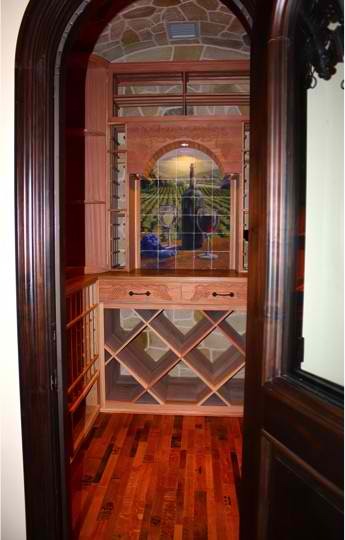 When hand-carved by a professional, wine barrel carvings will make your wine room stand out from the rest. Your wine cellar flooring must be installed by a professional who understands the importance of insulation in the quality of the wine. Flooring in climate-controlled wine rooms is often made of concrete, vinyl, tiles, or hardwood. Nowadays, wine barrel flooring is recommended, not only for budget-savvy wine collectors but also for those who want to help save the Earth. The reclaimed wine barrels are broke into different pieces to create three styles of flooring: Stave, Cooperage, and Wine Infusion. Stave flooring is made from the outer parts of the barrel, exhibiting markings from metal hoops. Cooperage comes from the top and bottom sections of the barrel and shows winery stamps and markings. Wine Infusion style flooring makes use of the inside parts of the barrel, which were stained by the wine stored in it. 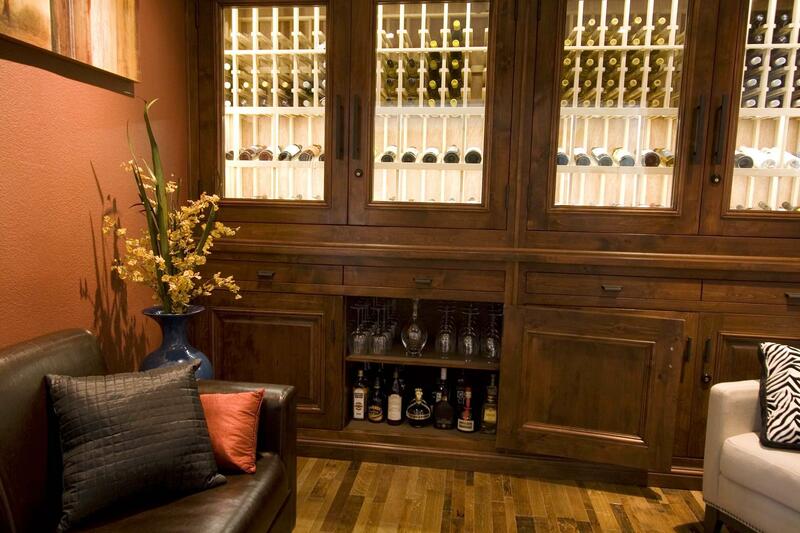 At Harvest Custom Wine Cellars and Saunas, we always want our client’s wine room to be both appealing and functional. We recommend incorporating wine room accessories and art pieces to add sophistication to your wine storage facility. Need help? Contact us today at (804) 467-5816.